The 2017 Ozzie Gladwin Canoe Marathon will take on a new from in a weeks’ time when the race moves to the Msundusi River as opposed to its usual Mngeni River course and gaining seeding points will be vital for FNB Dusi title hopefuls on Sunday, 26 November. With the cancellation of the Umpetha Challenge this year and some much-needed rain falling over the past few days Natal Canoe Club have decided to take over the route traditionally used by the Dusi season opening Umpetha for the Ozzie Gladwin next weekend. The race will provide a number of paddlers with their first glimpse of the Dusi route as they build up to the February showpiece, however a good showing at Ozzie will put front-row seeding hunters in with a good shout with very few seeding races available on the calendar. The Ozzie Gladwin presents a tricky conundrum for many of the Dusi title contenders as they are aware that they need to perform well, however they never want to give the opposition a indication into their early season form as it immediately makes them a target. Paddlers will be targeting specific races in the build up to the 2018 edition of the Dusi, however the Ozzie Gladwin seems to be almost a non-negotiable for many of the top athletes who tend to become reclusive in their build-up over the months of December and January. Despite its appeal as a Dusi seeding race, the Ozzie Gladwin also provides paddlers with a terrific early season hit-out and this year it will have a dual-role in that it is on the FNB Dusi route. The route will take paddlers on a lap of Camps Drift then down the river over the Ernie Pearce Weir, through the Commercial Road Weir, down the river until the Campbell’s Farm Portage and then give the paddlers the chance to stretch the legs over 3.1km to the finish at the Bishopstowe Hall. From start to finish the route covers just over 17 kilometres and will give paddlers the chance to test their Dusi skills repertoire for the first time as they prepare for February’s showdown to Durban. Much of the appeal of the Ozzie Gladwin was that the event provided paddlers with the chance to test their flat-water and river paddling, as well as running skills early in the season, however it might be argued that the 2017 route will give them more of an opportunity to test themselves, especially on the exact route that they will use at the 2018 Dusi. 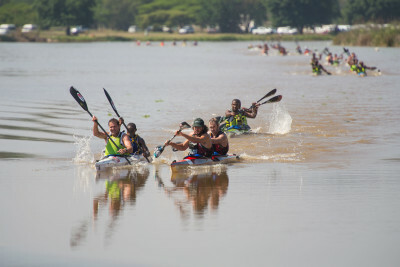 “Dusi seeding races are rated on an index scale with paddlers each being given an index,” Chairman of the South African Officials Association John Oliver said. “When race results are calculated and seedings points and times are given, races that have lower seedings offer more points due to the field being more competitive. What sets the Ozzie Gladwin aside from many of the other seeding races is that it draws the best paddlers with the lowest seeding.